“If I had a pony, I’d ride him on my boat, ” Lyle Lovett must have been singing about Howard Prairie Lake, a lovely mid-elevation destination about 18 miles (29 km) east of Ashland with both the best sailing and horseback riding opportunities in the area. The lake was formed by the 100-foot Howard Prairie Dam, which impounds Beaver Creek, built in 1958 by the Rogue River Basin Project as part of the Bureau of Reclamations. There are many campgrounds to chose from, depending on your preference for convenience to the boating amenities, morning sun, or seclusion. Grizzly Park offers tent camping, no hookups, and beautiful views of the lake. Apserkaha Park has group sites, hookup campsites RV hookup sites, and fully enclosed cabins, an easily accessible swimming beach, and a reservable group kitchen area. Klum Landing is close to the boat ramp, has campsites with shower and pit toilet accessible. Lily Glen is a great place to camp with your horse, with corrals and water right next to each camp sites, and miles of easy trails, if your horse will cross a bit of water. Willow Point offers easy access to hiking trails, no-hookup campsites, a fish cleaning station, and ample boat access. Sugar Pine is the group campsite, with a 150 person capacity in 11 campsites. The Pacific Crest Trail comes very close to the south-east corner of the lake, about 250 yards beyond Klum campground. Midsummer visitors will also have the opportunity to meet some of the “through hikers” who sometimes drop into the resort for a quick re-supply of snacks, or to charge cell phones. Many of them have fabulous stories but you might want to stand upwind. Howard Prairie is 36 miles southeast of Medford by way of highway 62, or about 17 miles east of Ashland’s exit 14. The reservoir is located at 4,526 feet, so winter snow is common, and the campsites are closed for the winter. This elevation is significantly cooler than the Rogue Valley floor so be prepared, especially in spring and fall. 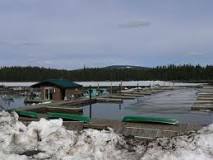 The lake is surrounded by a mature forest of Douglas Firs, Grand Firs, Sugar Pine, and Incense Cedar. Hot summer afternoons fill the air with an intoxicatingly lovely resinous aroma. Osprey and eagles hunt over the lake, and watch for signs of bear as you hike deeper into the woods. Our black bears are very shy, so the most you will likely see of them is their droppings, which look like very big dog-piles, and are filled with berry seeds in the late summer. Fishing is also great at Howard Prairie, the cooler water favoring some of the best rainbow trout in the area. Interesting Fact: Howard Prairie Resort is home to the Rogue Yacht Club, which offers free introduction to sailing classes to the public in the spring. Visit them at http://www.rogueyachtclub.org. Directions: From central Medford, take Hwy. 62 towards White City, turn right on Hwy. 140, turn right on Hwy. 37, at the end of Hwy. 37 turn right on Dead Indian Memorial Hwy. When you see the Howard Prairie turnoff on the left, take it. You will drive right past Howard Prairie and continue another few miles on the same road to reach Hyatt Lake. Another way to reach Hyatt Lake is to take Hwy. 66 out of Ashland past Emigrant Lake about 19 miles to the Hyatt Lake turnoff on the left Dead Indian Memorial Road, Ashland, Oregon – – Take I-5 to Ashland Exit 14, east on Highway 66 0.6 mile) Take Dead Indian Memorial Rd (Mountain Lakes) approximately 17 miles, then turn right onto Hyatt Prairie Road. You can get a one-day license to fish from the Resort Marina, if a last minute urge to wet a line comes over you.